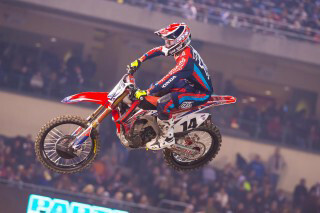 Al Lamb’s Dallas Honda - The 2015 AMA Supercross series took off on a strong note at the Angel Stadium Anaheim. Team Honda started off the season with a bang rallied by a powerful podium finish exhibited by Trey Canard. The chilly evening and a slick track surface did not deter the Oklahoman in executing a striking show as he went on to salvage an eight place start within the main event. He advanced to the third slot before completing the midway point. As the long season unwinds before us it is apparent that the 450-class veteran rider will set out to accomplish dramatic targets and performance levels to maintain a distinct position to the end thus ratifying his position as title contender. Things were not as rosy for Cole Seely who was taking part in his first full race officially representing Team Honda. Failing to back off that extra notch at the crucial point had Seely taking a number of close encounters with the track. This and a dose of bad luck impacted on his final results pushing him to the 14th place towards night’s end. Yet all are not lost on this first day of the series as the talented Californian look forward to transforming his bad experiences into better performances as the season unfolds. · The season opener came earlier than expected this year. With most of the team members and riders still recovering from excesses of holiday spirits and with Anaheim 1 playing a big role in their minds there were lots of mixed sentiments about the early kickoff. Cole Seely is predictably the least affected as he resides just a couple of blocks from the stadium. A proximity that will not make a significant dent on his schedule. Yet for riders like Trey Canard it was a long travel from his hometown in Oklahoma. Canard is reported to have jested about being away from home on New Year’s Eve saying that he and his wife Hannah had the opportunity of sleeping well before midnight. · Canard was among the seven rider team to face the pre-event press conference scheduled for the day before the race. Canard spoke at the function which as usual was chock-a-block with reporters and fans. ‘I have had a great off-season. Now I am excited at being at the first round and healthy’ said Canard. · Seely and Canard had the distinct advantage of testing out the track following the press conference. An enthusiastic Seely commented that it is always a plus point to be able to ride even a part of the track prior to a race. He added that having three practice sessions was not sufficient if you need to get really up-close and personal with a track. They also had the luck of enjoying the track with whoops already completely built on the media day. · Canard and Seely are both returning members of Team Honda sponsored by Honda Racing Corporation. Their return to the team made headlines during off-season. Team Honda hosted Mr. Yoshishige Nomura, HRC President during season opener of AMA Supercross. Mr. Nomura has a long standing with the squad supporting them through many successful phases during the 80’s and 90’s. · The day program saw Canard setting third quickest time for qualifying practices clocking a neat 54.980 seconds. Seely followed at a strong seventh position with 55.900 seconds. The two helped propel the team into the second heats of the evening program. Yet Eli Tomac of GEICO Honda was the top rider for pre-qualifying rides scoring a best lap at 54.586 seconds. · Competition was tight with Canard overcoming a jittery start during his heat race and going on to secure fourth place at lap one second to Tomac. His spectacular finish earned him a place in the main event while Canard and Tomac were the only riders to clock excellent lap times. · Bad luck followed Seely for most part of the night. On top of a rather lame sixth place in the heat race he also had a terrible crash on his third round in semi 1 resulting in a transfer through LCQ and a weak gate pick in the main event. · Dan Betley, manager of Team Honda said that all players flock to Anaheim 1 with great expectations. ‘There is so much hype, lots of people and lots of distraction’. The extra pressure is most palpable during season opening and Betley feels that it is very important to have all his team players on a healthy note both physically and mentally to help them overcome nerves and face the next 16 or more weeks with gusto. · Team Honda appears at Phoenix on 10th January as they take on the challenge of round 2 AMA Supercross. Cold and clear conditions are typical for January in California where for most part of the year the weather is warm and toasty. This year the riders were welcomed with an enveloping chilly biting cold at the Angel Stadium of Anaheim as they gathered for the season kick-off. On race day the temperature dipped 39°F matching the city’s historical low. Riders sought warmth in layers of clothing as they waited their chance at the track. According to Rich Simmons mechanic of Cole Seely Team Honda has come prepared for the chilly weather having practiced out in the bitter cold for days. Trey Canard said that when taken bike wise the riders were not much impacted by the cold. Seely said that he actually enjoyed riding out in the biting cold weather. ‘May be I am more hot blooded. The thing is I struggle more when I get in the humidity and heat in the East Coast. So I prefer the cold and dry California air’ he said. In this type of weather however, the biggest problem is traction. The chillier the air the more likelihood of moisture in the track and a slick soil can be a major disaster for a performing rider.